Gone are the days of films like “Breaking Away” and “Quicksilver,” where non-geeks rode bicycles triumphantly on the big screen. Today, if you see an adult on a bike in a film, it’s usually just a narrative tool to suggest that they’re a loser (see “40 Year Old Virgin”) or an eccentric kook (as in the protagonist of “I Heart Huckabees”). In addition to these observations, there are many more on the astute “The Bicycle in Popular Culture” blog, which covers our current culture’s view on the world of bicycling. But on the small screen — from laptops to iPhones — things are different. The new Flaming Lips video, as one example, has more bare flesh on bike seats than Queen’s “Fat Bottomed Girls” photo shoot. 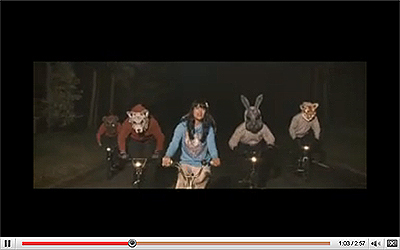 The 2007 Bat for Lashes video “What’s A Girl to Do” is one of coolest songs set to the film, and it includes, improbably, freestyling furries on BMX bikes riding down a darkened road. 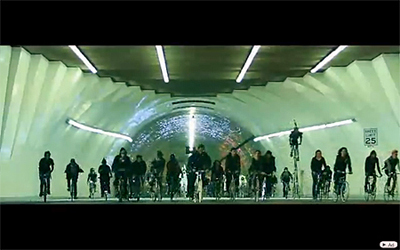 The new video for the 30 Seconds to Mars single “Kings and Queens” is worth watching for anyone who’s heard about Los Angeles’ Midnight Ridazz rides. A bit of departure for 30 Seconds to Mars, according to some critics, the single is from the band’s third record, which is scheduled for a December release. The band is fronted by actor Jared Leto, and the new single is U2 adjacent, featuring Leto getting Bono-esque. All this is intermixed with scenes from a Midnight Ridazz ride through L.A. Sounds odd, I know. But the video, which is as polished as a chrome Pista, has some awesome shots of locations that are staples of any Ridazz ride through downtown Los Angeles. There’s the 2nd Street tunnel, which looks positively sanitized, and the 6th Street Bridge. It also includes landmarks like the planetarium at Griffith Park, the ferris wheel at the Santa Monica Pier, an L.A. fire, as well as plenty of fixed-gear freestyling and a tip of the hat to Banksy’s flower-filled Molotov image. Take or leave the 30 Seconds to Mars video. You can always turn off the sound and skip the band scenes. The bike culture in the background — from tall-bikers to gas-mask-wearing Mad Maxer types — is worth a look. —Stephen Krcmar wrote a series about Midnight Ridazz for KCET in Los Angeles.